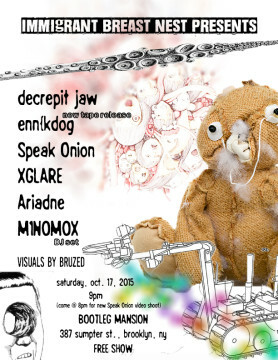 Immigrant Breast Nest Presents Show in Brooklyn, October 17! Immigrant Breast Nest presents. . . Immigrant Breast Nest is throwing our biggest party of the year. We are celebrating a new cassette release from Decrepit Jaw, “World Witness,” and shooting a video for a forthcoming Speak Onion track featuring MC M.C. Bio aka Bill Pulaski (aka Will Smith of Buckshot Facelift and Artificial Brain). Show up early for the video shoot if you are truly down to party. There will be some drinks provided to everyone who shows up early to mosh on camera. After the shoot, we have a diverse array of live electronic music performances in true I.B.N. style, plus M1N0M0X DJing for true noise dance party vibes. Everything is loud, let your ears hear it.